Netsuite is the leading provider of on-demand, integrated business management software for growing and midsize businesses. Companies can manage all key business operations — in a single hosted system, including: customer relationship management (CRM); order fulfillment; inventory; accounting and finance, product assembly; ecommerce; web site management; and employee productivity. WebCanDo.com is an approved SuiteFlex Developer and provides Netsuite development and support. We specialize in providing professional services including ecommerce and web setup, consulting, provisioning, data migration, remote service administration, help desk support, and much more. 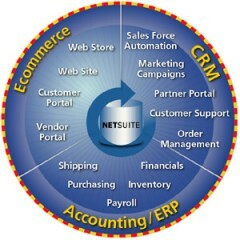 NetSuite enables companies of all sizes to manage all key business operations in a single, integrated system, which includes customer relationship management; order management and fulfillment; inventory management; finance; ecommerce and Web site management; and employee productivity. NetSuite is delivered as an on-demand service, so there is no hardware to procure, no large, up-front license fee, and no complex set-ups. Finally, NetSuite's patent-pending "real-time dashboard" technology provides an easy-to-use view into role-specific business information that is always up-to-date. Domain Provisioning: Set up Netsuite for your domain. Data Migration: Carry over and import products into your new Netsuite web store. Configuration and Customization: Configure Netsuite portal settings and configure company store. Design Netsuite theme and templates Custom design Netsuite website and store. Training: Train employees to use the Netsuite web portal and e-commerce site and train administrators to perform maintenance tasks. API Integrations: Develop custom extensions and infrastructure integrations with Netsuite. Application Development: Develop lightweight web applications that plug into the existing web stores and integrate with Netsuite. Helpdesk Services: End-user support complements Netsuite support offering for domain administrators. Netsuite is a registered trademark of Netsuite Inc.